Are you pregnant and attending a wedding in the next couple of weeks but haven’t found a dress that can fit your ever expanding baby waistline? Well one designer has taken this issue to heart and has created a line of elegant short dresses and gowns that you can convert to suit your style and growing belly needs, Butter by Nadia. These dresses are soft, lightweight and super easy to convert to create a strapless or a one shoulder style. Here is a how-to video guide on how to convert the dress to the different styles. In order to make the process of finding a dress even easier, one of our GMD stylists has paired one of the longer dresses to accessories from our website. 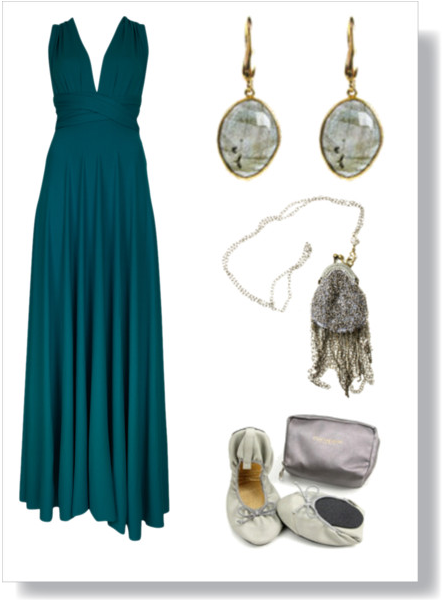 We’ve featured our Cerulean gown with silver ballet flats and accessories to add some shine and glamour so you can feel elegant and comfortable while attending your event. We have many different styles and colours of Butter by Nadia dresses to rent out, so make sure to visit our website. Posted August 17th, 2012 in GMD's Dress Code Guide, How to Wear it, Uncategorized.